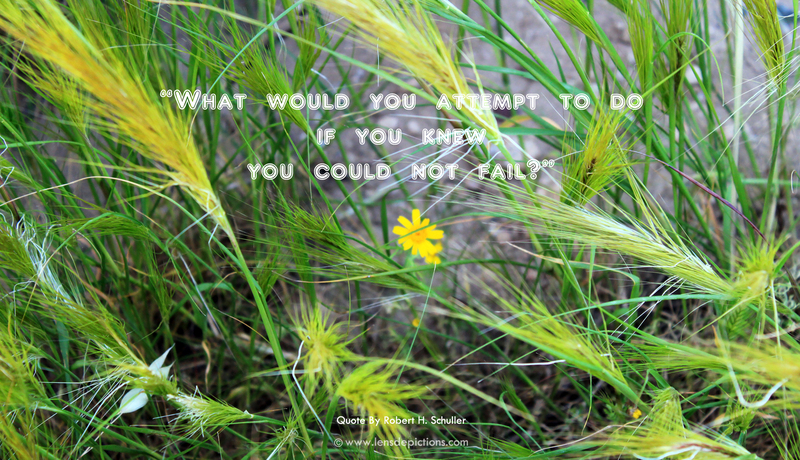 What would you attempt to do, if you knew, you could not fail? This Christmas, I noticed this amazing quote outside a church. The answers to her question were many. Actually more than I had thought! Later, I searched the web, and found out that the quote is by American pastor Robert Schuller. This very simple query presented before us by the late pastor has a very clear message. New Year is all about new dreams and new possibilities! So I decided to share this quote with all, and design a very special wallpaper for subscribers and readers of Lensdepictions, hoping, that it will help you welcome your New Year 2017 in a truly inspired way! The next step was to decide one of my photographs to use for the wallpaper. Now, to me, nature has always been a strong source of inspiration, even motivation, for my creative endeavors. I always try to see some great lessons quietly hiding in those seemingly simple things in nature. Many photos in my Nature Photography gallery are made with some of such moments where I had stopped to observe and learn. I can write a blog post about my contemplation over each of them (and I certainly plan to do so whenever time permits :P). For now, I picked this, one of my all time favorite compositions made by me, for the wallpaper! It was in the outskirts of Larnaca Cyprus… I had stepped inside a farm to take some pictures of hay rolls. I wish your New Year is all about knowing the answer to above question and pursuing those answers with all your heart!